Blind Adam will be exhibited at high-end concept store Métal Flaque on Rue de l'Échelle in Paris from January 25 onwards.. Blind Adam is an art project mostly inspired by Jean Cocteau's and Giacometti's artwork and by the allegoric tale "The Emperor's new clothes". All these influences crystallized into the "invisible clothes". These constructions that represent garments stripped to their bare structure have a strong imposing presence which in the same time can also look almost ghostly. Another characteristic is that they look like manuscripts with visible corrections on them and that they have a trompe l' œil 3D effect. 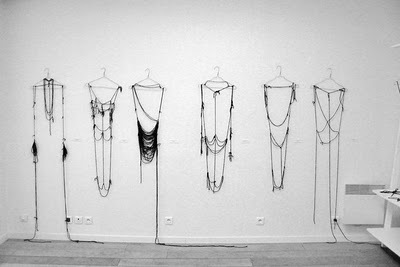 The basic idea is the creation of pieces , made from assembled knot yarn, that resemble clothes' skeletons or different forms , depending on the concept each time . Former Greek fashion editor Thanos Kyriakides started Blind Adam in 2007. When actually blind, it was obvious his eyesight problem (retinitis pigmentosa -a genetic disease of the retina) became frustrating. The reasons were that aside from having to deal with working as a fashion editor who can't see very well, he also had to deal with people's reaction to it. Seven years later, Kyriakides developed some new skills in order to enable himself to continue working in fashion. By then, it was easy for him to understand all about a garment mostly by touching it. And one day, he decided to start this new project using use all his experience in fashion and also his studies on history of art.